What is your network configuration? As with all applications, there are bugs or problems that will arise. If you know how to deal with these problems, using the system will be much easier and less stressful. Use the steps below as a basic guideline to get the AHMS/QuickVet up & running again. This procedure will assist you in restarting the AHMS/QuickVet after checking the database. It encompasses many of the steps described as standard practice, so it's easy to accomplish, just a little more work. After the failure has occurred, you need to close the AHMS/QuickVet. 1. Close the AHMS/QuickVet on the computer or laptop. a.1. Press <Ctrl><Alt><Del> keys simultaneously once, and click Start Task Manager. is highlighted (and you may see a message next to it "Not responding"), and click End Task. a.3. 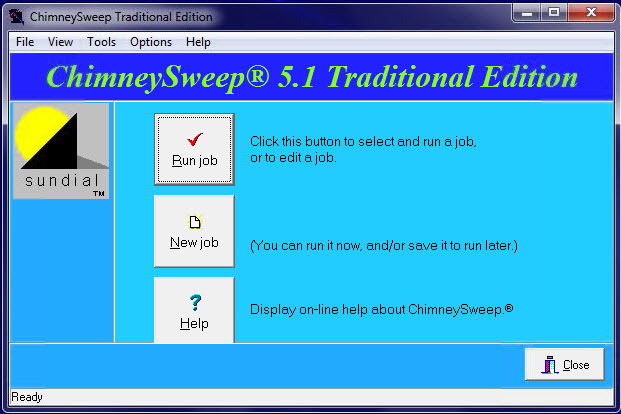 The End Task dialog box will appear and click End Task or Close Program. a. If the laptop/computer has mulitple hard drives or partitions, click on the dropdown list below Drive to Start Search, and repeat the step above for each of the drives. You do not have to perform this task on the CD or DVD Drive. 5. Double-click on Delete Private Files... (icon shown to the right) to delete any files found in the :PRIV: folder for each user. This will NOT delete any critical files or data. 7. Once the laptop/computer has restarted, log back on as you usually do, as long as you are the Administrator. a. If the laptop/computer takes a LONG time to restart, or errors appear during startup, please contact your IT company since there's a problem with this computer. 8. 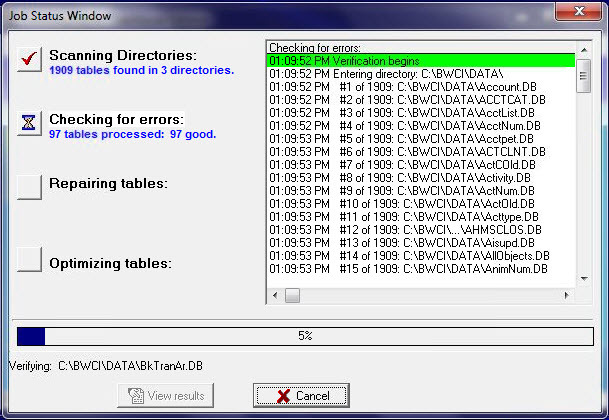 Double-click on Table Analysis (icon shown to the right). 9. This will open Table Analysis screen. Click Run Job. 10. The List of Jobs screen will open. 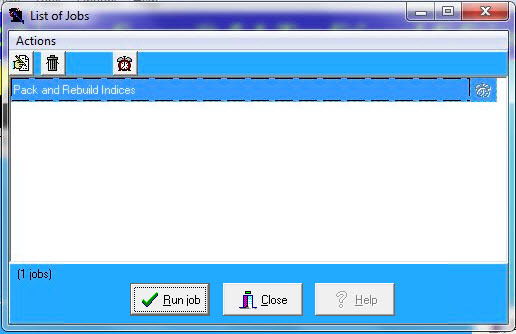 Highlight the job, Pack and Rebuild Indices, and then click Run Job. The Job Status Window will appear, and present the status of the Table Analysis as it checks the entire database. Once completed, click OK or the Job Status Window will disappear. 11. Start up all the computers, and resume using the AHMS/QuickVet. This procedure will assist you in restarting the AHMS/QuickVet after checking the database. It encompasses many of the steps described as standard practice, so it's easy to accomplish, just a little more work. After the failure has occurred, you need to close the AHMS/QuickVet at all workstations. This process only takes 5 - 15 minutes. 1. Close the AHMS/QuickVet at all workstations BEFORE terminating the AHMS/QuickVet at the server. a.2. Click on the Applications tab, verify that the AHMS/QuickVet is highlighted (and you may see a message next to it "Not responding"), and click End Task. 2. After the AHMS/QuickVet is closed everywhere, log off the session. a. If the server has mulitple hard drives or partitions, click on the dropdown list below Drive to Start Search, and repeat the step above for each of the drives. You do not have to perform this task on the CD or DVD Drive. 7. Once the server has restarted, log on as the Administrator. a. If the server takes a LONG time to restart, or errors appear during startup, please contact your IT company since there's a problem with the server.